Knight's Life slot is another hugely entertaining Merkur edition for online play, joining the likes of Hocus Pocus Deluxe and Magic Mirror Deluxe. 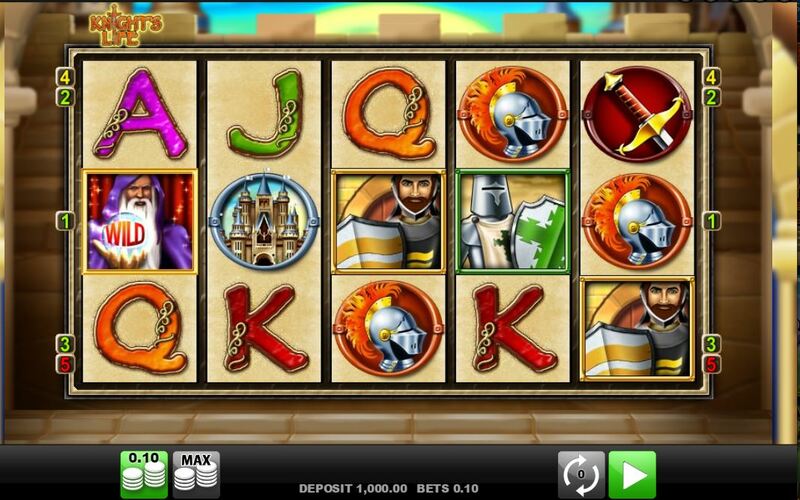 This history-inspired slot is quite volatile, so don't be surprised if it gets 'medieval' on your bankroll. The reels spin and land with a powerful drum roll, befitting a procession of the period. The graphics in Knight's Life have some great mini-animations for the character, making it quite pleasing on the eye. The period theme is reflected throughout all the symbols, but will this game be a knight in shining armour for you? We begin jousting with 5 reels over 3 rows and like the volatile Vampires slot Merkur have given us just 5 pay lines. As this will indicate the wins are significant for any 5-of-a-kinds and the best is the Wild Wizard whose crystal ball will pay 1000x bet plus doubles any other wins it's involved in. There are 3 different Knights in different heraldry of green, blue or yellow and these all pay 150x bet followed by the Castle, Shield, Helmet and Sword all paying 50x stake for the 5. The remaining icons are the high cards, A, K and Q paying 25x stake. Every Knight needs his charger and these mighty horses appear on all reels as the scatter and trigger a truly awesome fete of free games. Once three or more charger horses appear anywhere in view you are awarded a free spins battle where our 3 Knights in their different heraldry have a very special battle to wage against the other icons. You begin with 10, 15 or 30 spins for 3, 4 or 5 scatters respectively. You can retrigger them in the same way but you also get an extra spin for any two scatters as well, which may prove vital as we will see. So you progressively get the 3 Knights turning Wild each spin. On spin 1 the Blue Knight becomes Wild on reel one, on spin 2 he becomes Wild on reel 2 and thus after 5 spins he is Wild on all 5 reels. From spin 6-10 the Green Knight follows the same pattern, and from 11-15 the Yellow Knight. So after spin 15 you have all the Knights on all reels Wild, but that's not all! From spin 6-10 you get a 2x multiplier and from 11 spins and upwards you get 3x! This is why extra spins or retriggers are so important. You have the potential for 3000x stake 5-Wild hits from spin 11 until the end.